Unlike books that encourage rote memorization, this conversationally-written text puts the student at the patient's bedside, focusing not just on identifying rhythms or EKGs, but also on "Now what do I do for the patient?" 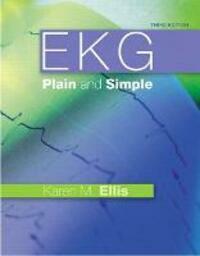 Assuming no prior knowledge, EKG PLAIN AND SIMPLE, 3/e covers EKG from basic to advanced concepts. Part I progresses seamlessly from basic cardiac A&P through waves and complexes, lead morphology, and rhythms. Part II covers 12-lead interpretation, axis, hypertrophy, myocardial infarction, and more. The text presents many clinical scenarios, anecdotes, and critical thinking exercises, plus hundreds of practice rhythm strips and 12-lead EKGs. This edition adds new scenarios, chapter notes, and tables; more medication information; and new coverage ranging from MI symptoms to hemiblocks.